The bead-makers of 8th century Ribe used pieces of glass gathered from old Roman mosaics as their raw material. They didn’t have access to newly manufactured glass. This is one of the many details that tells us about the city’s network. If you want to know anything about the Viking Age, Ribe, in west Denmark, is the place to go. Archaeologists from Aarhus University and Southwest Jutland Museums (Denmark) have been excavating the Viking city as part of the Northern Emporium Project in minute detail. We have dug down to three metres, where we find traces of the first cities of the Nordic region. Deep beneath street level are thousands of Viking finds. We have discovered everything from beads, amulets, coins, and lost combs, to dog excrement and gnawed bones. We have also been surprised on several occasions, such as when we discovered a piece of a lyre (a harp-like stringed instrument), complete with tuning pegs. This discovery alone gives the Viking trading city of Ribe a whole new soundtrack. 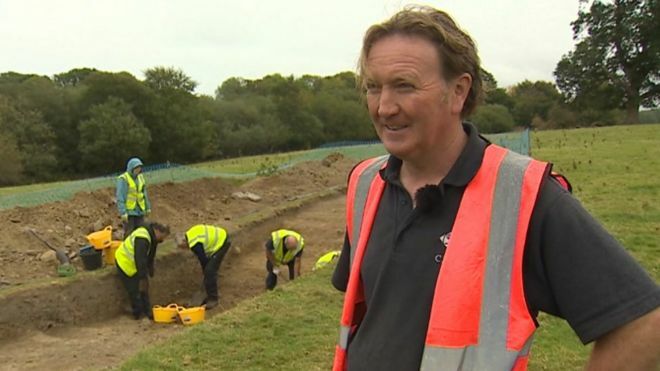 An archaeological dig at 13th Century Chirk Castle is trying to determine the age of Britain's longest ancient monument. Offa's Dyke runs 177 miles (285km) from Chepstow to Prestatyn and takes its name from the 8th Century Anglo-Saxon king of Mercia. It is believed Offa built the dyke as a border between his kingdom and Wales. However, opinion is divided about the actual age of the dyke, part of which runs through the castle's grounds. A previous examination of part of the dyke by experts suggested work may have started between 430 and 652 AD - more than 200 years earlier than the widely-accepted date of construction.